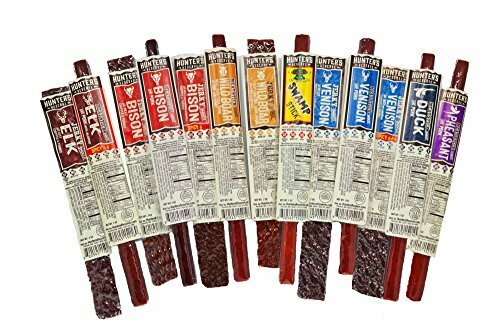 Hunter’s Reserve “Wild Pack” Meat Sticks and Jerky Strips, 24 Variety Pack of Wild Game Flavors, "Nitrite Free"
Perfect for taking on the trail, to the deer stand or your favorite sporting or outdoor recreational event; a great gift idea for the jerky lover and wild game meat connoisseur. Hunter’s Reserve full line of top shelf wild game meat sticks, summer sausages, jerky’s, specialty cheeses and cheese spreads will surely impress the gourmet connoisseur of wild game flavors. Hunter's Reserve located in Americas Heartland has provided gourmet specialty game products for 20 years. If you have any questions about this product by Hunters Reserve, contact us by completing and submitting the form below. If you are looking for a specif part number, please include it with your message.